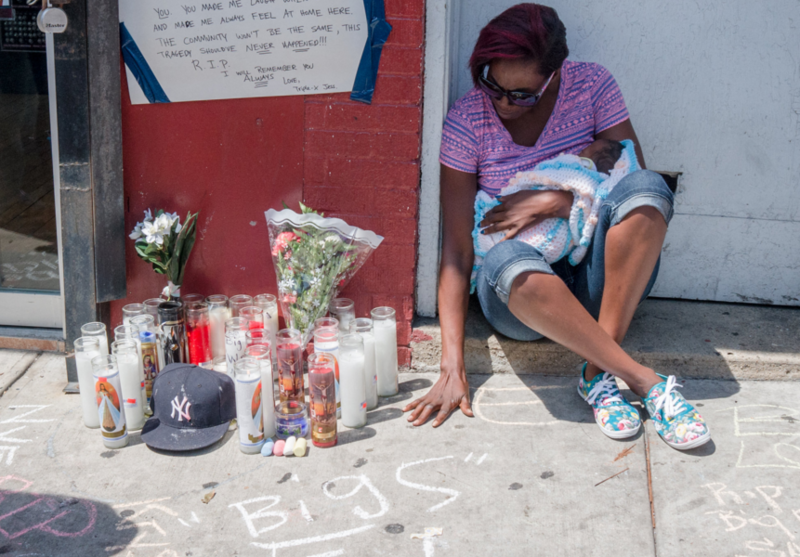 Will the Feds Fail Eric Garner? "Call him out for the monster that he is." 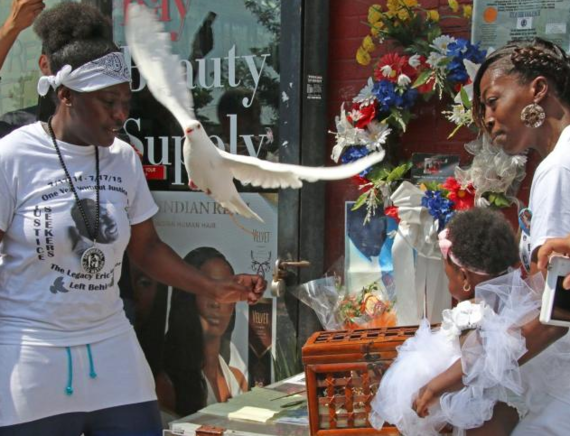 That's the message Jewel Miller, mother of Eric Garner's youngest daughter, Legacy, has for the Department of Justice this week. Miller, 38, is helping to organize a rally in front of the U.S. Attorney's Brooklyn office Wednesday morning. 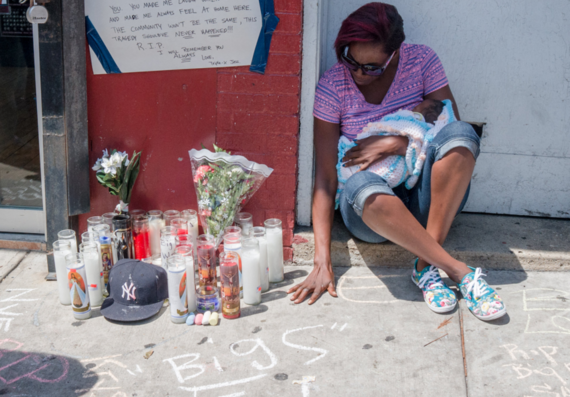 She and others want the feds to bring charges against Daniel Pantaleo, the NYPD detective who choked Garner to death in 2014. Earlier this month it was reported that federal prosecutors have begun to show evidence to a grand jury, raising hopes that Pantaleo, who was not indicted by Staten Island grand jury, might face justice. Iris Baez, whose son Anthony was also infamously choked to death by a cop in 1994, saw her son's killer, police officer (and police union delegate) Frank Livoti, eventually convicted in federal court for violating Anthony's civil rights. Baez, who will also be at the rally Wednesday, says that the feds won't bring charges unless they know they can win. The Justice Department opened a civil rights investigation into Garner's death back in December of 2014, fourteen months ago. Miller wants to pressure U.S. Attorney Robert Capers, who has shown he can prosecute corrupt cops, and Attorney General Loretta Lynch. It was Lynch who has apparently put an internal NYPD investigation on hold, according to police commissioner Bill Bratton, allowing the NYPD to drag their feet on any potential disciplinary actions (i.e. firing him--though no one should be surprised if the department simply doesn't charge Pantaleo with anything). "Show us that you guys are gonna do you job," Miller says of the feds. "How can we have peace?" Miller and Garner's daughter, Legacy, is now 19 months. She has started to say "Daddy" and "Eric" when shown her father's picture, Miller says. "It's emotional for me to have to raise her like that." She says she sometimes rethinks her decision to have kids when she has to explain to her other older children why the justice system has so emphatically failed Eric. 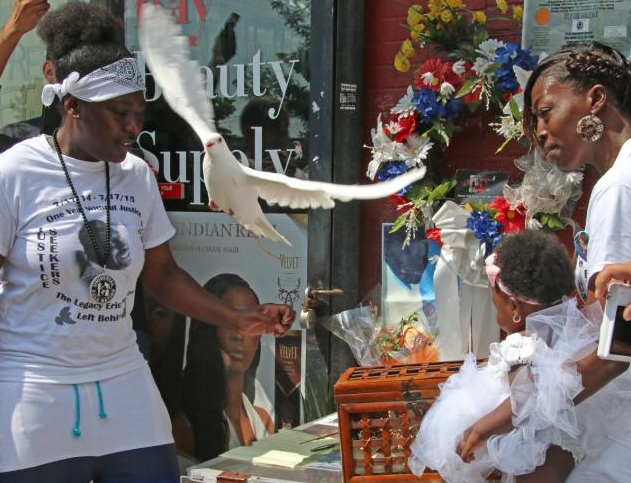 "July 17th is everyday for me," she says, referring to the day Pantaleo and other police officers piled onto to Garner on a Staten Island street. Benjamin Lawton Sr., Garner's first cousin, says that those other officers and even the EMT workers on the scene that day should have been punished. Last month an NYPD sergeant on the scene of the Garner incident, Kizzy Adonis, was disciplined by the department, losing her gun and badge. "If she's wrong, then they're all wrong", Lawton says, noting that Adonis was black while the officers who actually jumped on his cousin were white. "He's still collecting money, he's still enjoying a pension", a frustrated Lawton says of Pantaleo. His last memory of Eric is seeing him at a memorial and family cookout. In fact, Lawton says, Garner had returned from a family get-together in Baltimore shortly before he was killed. He went out to the block to say hi to some of his friends before Pantaleo approached him. He wasn't even selling cigarettes that day, as most reports have described it. He was breaking up a fight, "doing the police's work", when the cops stepped out of their cars. Lawton says he hopes that the feds are up to the task after former district attorney (and now congressman) Daniel Donovan "made sure there wasn't going to be an indictment." The Justice Department has "more than enough evidence", Lawton says. "How long does it take to do an investigation? What's left to investigate?" Meanwhile Miller says says little has changed since Garner's death. Born and raised in Staten Island, Miller says that things in the borough are going back to normal. At her job working for the Parks Department she's reminded of the disparate racial realities that still exist today. She notices trees and flowers being planted early in some neighborhoods, with other areas not even getting cleaned or given basic maintenance. It's things like this that make her cynical to talk of elections or candidates. She's also afraid to call the police. Two community affairs officers showed up at her house to try to get her older children to enroll in police-organized programming and Miller flatly denied them. "I don't feel safe to even have my kids cross the street with you," she told the officers. When they asked her why she pointed over to a picture of Eric with Legacy in his hands and she closed the door.